"Savour each bite, roll it around in your mouth, enjoy the texture" said The Knife. No we were not on some Masterchef audition, we were on one of the legendary FInely Chopped Walks through the lesser known bylanes of Bohri Mohalla. The texture we were savouring was of Khiri or cow udders. This probably in my mind was the stand out dish of the night. This was my second time back for the Bohri Mohalla Walk and probably my 6th Walk with The Knife. Despite the rain, traffic (actually there was none that night), and distance- Thane to under the JJ Flyover, I really was craving kebabs cooked slow on charcoal flames. The other reason, I show up for these walks is to be part of a group of people who really enjoy their food and conversation. Its a great way of meeting folks, who are passionate about their food, cooking and of course experimenting with new cuisine. This particular walk probably covers 3 small lanes- so its really not much of a walk and covers around 6 stalls/ restaurants in the neighbourhood. What makes Bohri Mohalla different from Minara Masjid is that it is open all year round- not just during Ramzan. However, it is open longer and is busier during Ramzan. I did walk around Minara Masjid a few years back. It was very different from Bohri Mohalla. This place has been in business for 125 years and is known to make the freshest of fruit ice creams. Indulgently creamy and rich, they make hand churned ice cream every morning which is sold out by night. Be sure to ask him what is in season. We savoured a delicious Sitafal and Lychee ice cream. Try the mango, strawberry and tender coconut as well. This guy gets sold out very quickly. He has a corner stall, lined with charcoal grill cooking up a tandoori chickens, seekhs and the whole lot of familiar kebabs. We skipped to the more adventurous Khiri - cow udders and a little less adventurous- beef boti which we ate with fried crunchy parathas. Both dishes stellar, but the winner here was the khiri, perhaps the most delicate piece of meat I have ever eaten. This place has a giant tawa serving up beef egg rolls, Burmese rolls, Malay rolls. We tried the chicken egg rolls, the bheja fry and potatoes dripping in beef tallow. One word- Delicious! A little ahead of the inital food stops in a perpendicular lane is a series of pulao guys. We stopped at one stall which was small. The serving of pulao with pieces of beef was unimpressive looking. It almost looked like jeera chawal with pieces of meat. I scooped a bite with my hands and was in for a shock. This simple looking rice was packed with flavours of khada garam masala, ghee and chilies. The meat was tender as ever and was a beautiful compliment to the rice. I take my words back, I was wooed and seduced. Be prepared to eat with your hands. One of the bylanes. The weather held for our walk. This was the place I was most looking forward to. On the previous walk, I was so full by the time we reached here that I could not even take a bite. This time, I paced myself and was ready. We were here almost at 11:30 pm, just around the time he starts to serve during Ramzan. Bara Handi as Kalyan explained were 12 pots simmering slowly throughout the day cooking various cuts of the meat. Mostly left over parts that would be thrown out such as the trotters, the rump. 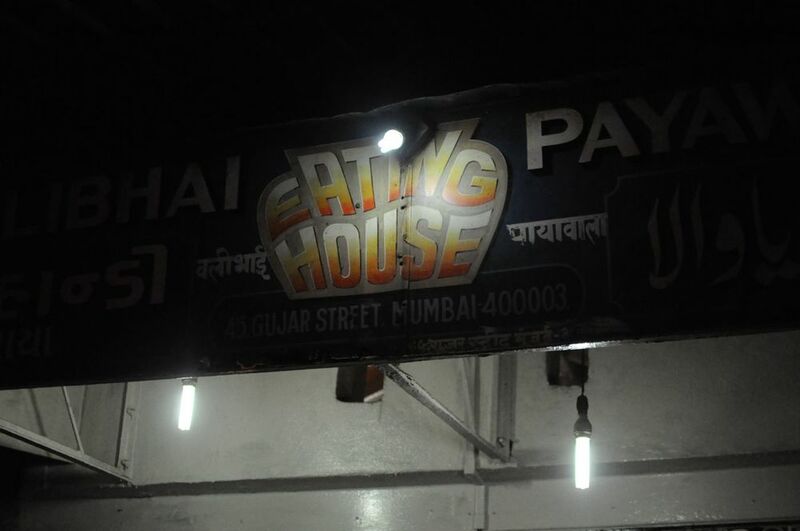 The famous Nalli nihari (marrow) is also served up here. Imagine a bowl full of really hot, red curry, oozing with the fat of the meat, cooked slowly with lentils and served with a large Afghan style bread. The bread only helped from burning my fingers but believe me I was dying to just tear in there and pull the meat off the bone. I cant decide what I enjoyed most between the nihari, rump and trotters. Listen to Kalyan when he says this is the best place for Bara Handi. The last stop on this walk, and full circle back to starting point is at Tawakkals for his Malpua along with a kesar firni. I was too full to try and I think I forgot to photograph it as well. But look at the picture above. Look at how it is singing for you. Dip your fingers in that fat. Thanks Kalyan for an amazing walk once again. The cost of this particular walk was Rs. 2500 which included all the food, repeats, and of course the knowledgable host and the lovely company. If the reader is interested there is more information available on Kalyan's blog.